Navitaire delivers industry-leading technology services that enable growth, profitability, and innovation to airlines and rail companies worldwide, including many of the world’s most successful low-cost airlines. A wholly owned subsidiary of Amadeus, Navitaire has offices in North America, Europe, Asia, and Australia. Navitaire provides a technology solution for all business models of airlines, including reservation and passenger services. The solutions capture an extensive amount of airline customers’ travel statistics and background data. Navitaire wanted to explore the possibility of developing a machine learning (ML) model that could give its customers the ability to present special offers and packages to individual travelers in order for them to generate more revenue and boost profitability. Navitaire’s infrastructure landscape utilizes an on-premises Microsoft SQL database. However, Navitaire was interested in a cost-effective AI/ML solution hosted in a cloud environment that could allow its global clients to deliver customized offers to travelers. Navitaire chose to utilize Amazon Web Services (AWS) due to its ability to provide advanced data science services. AWS recommended to Navitaire its AWS Premier Consulting Partner, 1Strategy, to advise and assist in evaluating how AWS could provide the capabilities and cost-effective solutions of interest to Navitaire. “Our engagement with 1Strategy has enabled Navitaire to understand how to better harness the power of machine learning on AWS, enabling us to better support our clients’ efforts to leverage AI/ML workable solutions,” said Kyle Stromberg, Chief Technology Officer at Navitaire. Phase 1: Access and analyze the data to develop a customer profiling algorithm which can group passenger spending patterns into actionable segments. This model will provide recommendation of spending habits or behavior for each subsequent passenger. Phase 2: Deploy the AI/ML model into AWS utilizing Amazon SageMaker, and build an operational model to understand how it could fit into Navitaire’s ecosystem. 1Strategy introduced and explained the benefits of employing Amazon SageMaker and Machine Learning technologies on AWS. Amazon SageMaker is a managed machine learning service that allows companies like Navitaire to quickly build and train ML models and deploy them at any scale directly into a hosted environment. 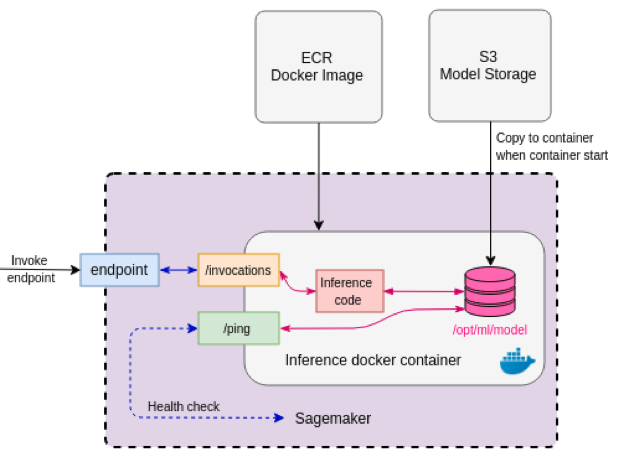 1Strategy designed the following Amazon SageMaker architecture for Navitaire, which utilizes a Docker container, Amazon API Gateway, Amazon Elastic Container Registry (Amazon ECR), AWS Lambda, and Amazon S3. By using Amazon SageMaker, 1Strategy’s data and analytics team created an ML prototype on AWS that could allow Navitaire’s customers the ability to identify, with 75% accuracy, whether passengers would pay for an upsell on baggage fees. This prototype model could also empower Navitaire’s customers to make smarter decisions about offering add-ons or upgrade options for revenue generation. In addition, Navitaire could potentially employ similar modeling techniques utilizing Amazon SageMaker in a myriad of other offerings and add-ons, such as seat upgrades, boarding priority, or same-day change fee, etc. 1Strategy is a Premier Consulting Partner in the Amazon Web Services (AWS) Partner Network (APN), focusing exclusively on AWS. 1Strategy helps businesses architect, migrate and optimize their workloads on AWS, creating cost-effective, secure and reliable solutions. 1Strategy holds the AWS DevOps, the AWS Migration, and the AWS Data & Analytics Competencies. 1Strategy was chosen as a Launch Partner to the AWS Managed Service Partner program and is a partner of the AWS Public Sector Program. With experts having deployed AWS solutions since 2007, 1Strategy is a leader in custom training—providing customers with the knowledge, tools and best practices to manage those solutions over time. Headquartered in Seattle, 1Strategy teams are also located in San Francisco and Salt Lake City and support customers globally and across every vertical. For more information about how 1Strategy can assist your company with migration to AWS, building artificial intelligence and machine learning solutions, optimizing data and analytics, or receiving custom training, visit 1Strategy.com or contact us at info@1Strategy.com.